If you are anything like me, dear readers, then you cannot believe it is already November. It seems like just yesterday we were taking a look at the summer TV lineup and giving out Glee superlative awards. And now it's 32 degrees outside when I wake up and Christmas decorations are appearing in malls everywhere. But before we dive headfirst into singing Mariah Carey's "All I Want For Christmas Is You" (which of course cannot be done until after Thanksgiving), let's use this week's Magical Monday Moment to take one more glance back at October and one of the best Halloween costumes of the year. For those who weren't paying attention to amazing cartoons in the '80s, Krang is a supervillain from Dimension X in the Teenage Mutant Ninja Turtles saga. With Shredder, Bebop and Rocksteady at his command as well as a killer Technodrome and massive robot body to wield, the fact that Krang was only a brain never seemed to stop him from causing heaps of trouble for the Turtles. 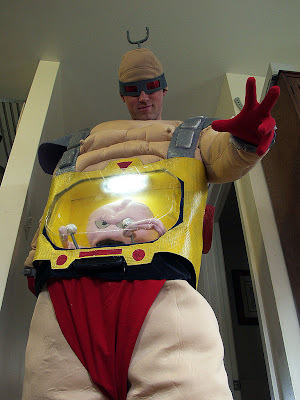 Bought a super-cheap and crappy sumo wrestler suit on eBay. Restuffed it with polyfill so it didn't look so crappy. Ripped apart two motion-activated creepy hand bowls and rewired them to connect with one switch and operate on a 9V battery. (My husband mostly did this part, because I wouldn't have had time to complete the costume otherwise.) Extended wiring on switch and ran through the torso and out the right sleeve so it can be operated while wearing the suit. Attached wire skeleton for tentacles to the disassembled creepy hands mechanism and pushed skeleton into tentacles. Built box out of posterboard and clear plastic lid from an oven tray. Installed small stick-on battery operated florescent light at top of box. Made control levers with dowels and foam balls wrapped in foil - secured in holes of the box with duct tape wound around dowel. Installed Krang in box. Cut hole in sumo outfit, installed box. in suit. Cut and spray painted a yoga matt and blocks of foam for belt, cuffs and suspenders. Installed. Put portable speaker at base of box, hooked to Zune on the left side of suit. Husband made a 30-minute mp3 of Krang soundbites ripped from the cartoon, to loop continuously. Ripped apart a red tshirt and made underpants. Created antenna from Sculpey and wire, attached to beige beanie. Made glasses from foam, elastic and cellophane. Red gloves bought, shoes pre-owned. Now, Melissa's video has over 118,000 hits on YouTube and she is officially my Halloween hero!